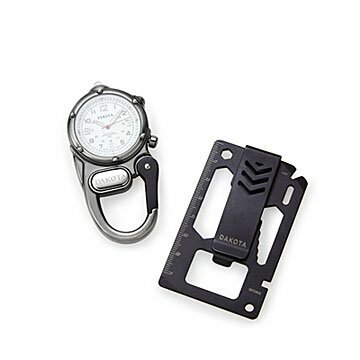 This gift set packs a watch, flashlight, money clip, and more into a duo of tools. Geared toward get-'er-done guys, this gift set packs a lot into a duo of tools. The clip-on watch with a glow-in-the-dark face features a red LED flashlight for nighttime operations. The money clip multi-tool incorporates a ruler, wrenches, bottle opener, straight screwdriver, pry, and spoke tool. Designed to tackle almost any small task, this set makes a great gift for Father's Day and year-round handy men. Watch movement made in Japan. Set made in the USA.